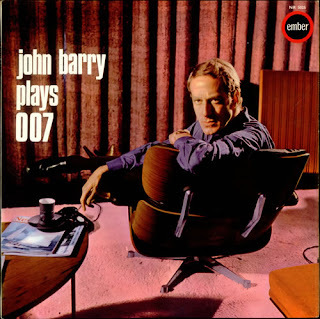 I've regularly listened to John Barry's soundtracks for many years, but when I'd heard he'd died, on January 30th, I stopped listening to his music. The news was a shock, out of the blue. I didn't want to be reminded that there'd be no more of the music I've grown up with. It's taken a few months for me to start again and I just wanted to talk a little about my very favourite of his tracks. He scored outer space like no-one else. Previous sci-fi movies set in space famously used classical music (2001: A Space Odyssey) or electronic atmospherics (Forbidden Planet), but John Barry's take was more about awe, mystery and trepidation, retaining the danger of humanity living outside the atmosphere. As long as I can remember going to the cinema, we're talking mid-1960s, I remembered his music. My Mum took me to see a re-release of You Only Live Twice (1967) in 1968. At the start of the story, a US space rocket is followed by another. The surprise of it opening up, then swallowing the other, never left me. The track 'Capsule In Space' describes danger approaching during a space walk. The score accompanies the action perfectly, but also works as a stand-alone piece. The experience in the cinema was enough to put me off space travel, the same way Jaws put me off swimming in the sea. I was then old enough to see Bond films in the cinema during their first run. 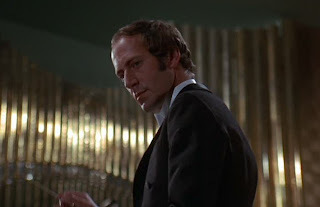 I especially loved the exciting music to the ski chases in On Her Majesty's Secret Service (1969). So much so that I'd concentrate on carrying the music away with me in my head. I did this for years until I could afford or find the soundtracks. 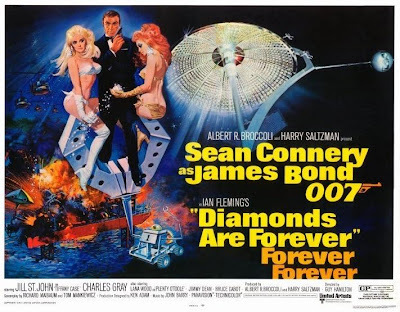 I was delighted there was another scene set in space in Diamonds Are Forever(1971), during the launch of a killer satellite. After several stage separations, the beautiful weapon deploys, then begins picking off targets around the world. The tempo of the space march '007 and Counting' matches its graceful motion, alternated with the horrendous power it unleashes. The theme tune to Diamonds Are Forever really imprinted on me. The impact of Barry's James Bond theme songs were combined in the cinema with the most lavish, widescreen 'pop videos'. Tom Jones, Nancy Sinatra and Shirley Bassey singing top ten hits with huge, naked, pop art visuals by Maurice Binder. The music and the images were also associated with the anticipation of two hours of the most exciting films of the time. For many years after their release, Bond movies weren't seen outside of cinemas, being continually re-released until TV eventually paid huge sums to show them, Dr No (1962) wasn't shown on TV in the UK until 1975. I had the chance to see each one several times in the cinema - the music was part of the attraction of seeing them again. The soundtracks never stayed in circulation on vinyl for very long. If you were lucky, they'd maybe appear when a new format, like music cassettes, were introduced. The search for the albums missing from my paltry collection kept me hunting through record shops looking for secondhand records or cassettes. 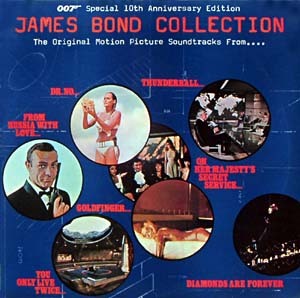 For many years, this James Bond Collection double-album (above) was the only Bond music to be reissued. A life-saving compilation of cues from the original soundtracks, at a time when there were dozens of weedy soundalike albums. Geoff Love cover versions weren't a sufficient alternative to the real deal. I'd even record my favourite sections off the TV, when no soundtrack was available. I waited decades for many missing cues to finally appear when the expanded James Bond soundtracks were released in 2003. But meanwhile, John Barry made more space music. After Star Wars (1977)became a big box office hit, he composed for three more outer space movies, around 1979. But he remained true to his earlier approach of danger and mystery. 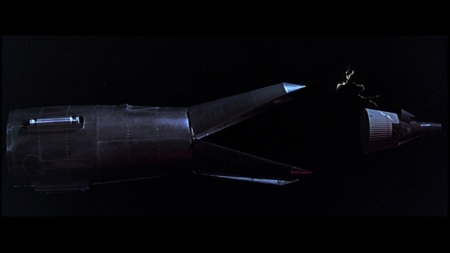 Moonraker put James Bond in his very own Space Shuttle. 'Flight Into Space' describes the tension of the launch in the familiar march motif. Again Barry describes the wonder of being in space and the surprises revealed out there. Another track 'Space Lazer Battle' anticipated some of the aural effects he'd use in The Black Hole. The scene of astronauts fighting in zero gravity is far more convincingly done than the one in The Green Slime. While Moonraker is far from the best Bond movie, I've enjoyed the soundtrack literally hundred of times. The main title to The Black Hole (1979) makes it sound almost like a sea-going adventure. Again there's a foreboding tone accenting the hazards, particularly from the black hole itself. This time, the whole album accompanies deep space. 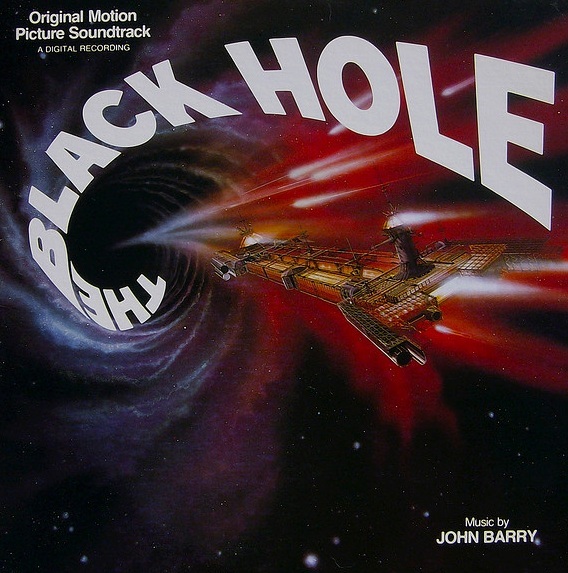 Barry's music has to carry the entire climax of the film with the track 'Into The Hole', using increasingly mysterioso effects. Lastly, I'll even mention Starcrash (1978). John Barry sometimes scored movies he later regretted. It may be embarrassingly (though enjoyably) awful, but tracks like 'Launch Adrift' are particularly beautiful. 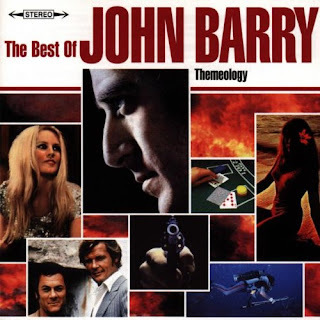 While the album isn't as consistent as the other two, it's still John Barry in his prime. 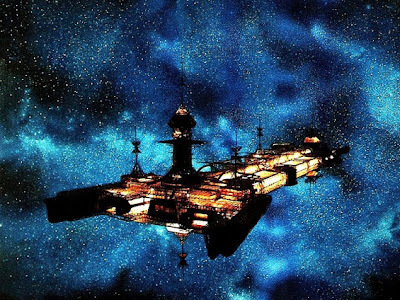 Among his many soundtracks, I notice a few tracks that seem out of step with the rest of the score - otherworldly moments reminding me of his 'space music'. In Beat Girl (1960) the track '2000 AD', in Midnight Cowboy (1969) there's 'Science Fiction'. In the superb score to King Kong (1976), the haunting 'Full Moon Domain'. And in Dances With Wolves (1990), 'Stands With A Fist remembers'. 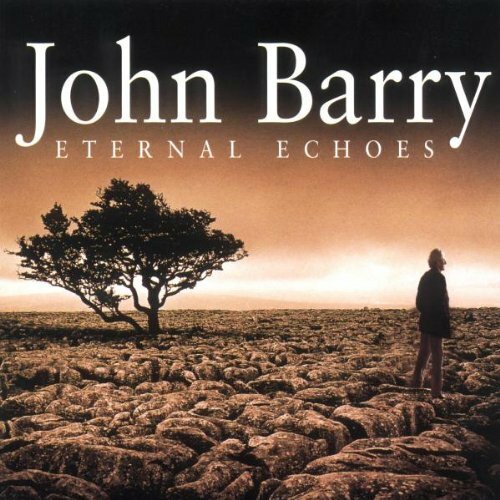 Barry's last non-soundtrack albums The Beyondness of Things (1999) and Eternal Echoes (2001) continued with echoes of the lost 'wild' west from Dances With Wolves. In both, there's a sense that he's summing up his life and saying farewell. But I had no idea that it was going to be so soon. Some exceptional James Bond soundtracks I haven't mentioned, From Russia with Love (1963), Goldfinger (1964), Thunderball (1965) and The Living Daylights (1987). They set high standards for how to make action even more exciting. The Ipcress File (1965) accompanied the low-key flipside of spying in the Cold War. This soundtrack propelled Barry into the A-list of soundtrack composers. Deadfall (1968) woke me up to his being superb music, not just a backing track. The fourteen minute 'Romance for Guitar and Orchestra' at the heart of Deadfall is one of Barry's greatest achievements. 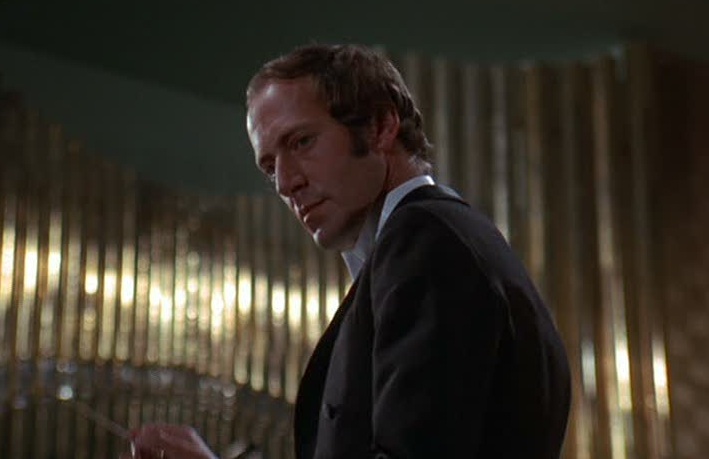 Working with director Bryan Forbes, the track had to be woven into the film, being performed in front of the camera, as well as scoring the action of the robbery scene that intercuts with the concert hall footage. Alice's Adventures In Wonderland (1972) is a rare musical from Barry. With songs as beautiful as they are strange. King Kong (1976) is one of his very best scores, again to be enjoyed many more times than the movie. My playlists of his music are made up of my very favourite tracks, cherry-picked from his albums. In all, they're still over 14 hours long. Some of it represents forty years of listening... and counting. Wow. Had no idea he had done all those soundtracks. Truly marvelous. And these are just a few of them. I see you are a fellow Brit, that used to hang out at Ken Cranes LaserDisc superstore in Westminster, CA. Me too, on my regular holidays to SoCal. I loved LaserDisc. I never quite get the same buzz from DVD and BD collection. Happy memories from the golden age!